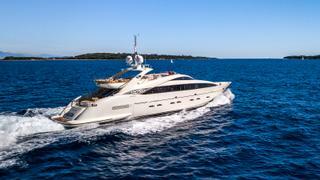 The 36.45 metre motor yacht Gemini has been listed for sale by Cornelius Gerling at Edmiston & Company. Designed by Andrea Valicelli, Gemini was built in GRP by Italian yard ISA to RINA class and delivered in 2007 with the same owner since new. A luxurious interior by Cristiano Gatto in neutral tones and dark wood cabinetry accommodates eight guests in four cabins comprising a full beam master suite on the main deck and three doubles. All guest cabins have entertainment centres, television screens and en suite bathroom facilities while a further three cabins sleep five crewmembers aboard this yacht for sale. The main deck saloon has a round table aft with formal dining for six, expandable for 12 guests, and an entertainment centre including a 52 inch Samsung LCD television screen, a surround sound stereo system and a bar. Forward is the relaxation lounge with comfortable settees, coffee tables and chairs, all in shades of chocolate and cream. The aft deck has every amenity for al fresco entertaining and dining, including two large sun pads and a set of table and chairs. Upstairs, the huge sun deck has been intelligently designed for outdoor living, including crescent shaped built in seating to port and starboard facing two circular tables, a large Jacuzzi tub, a bar, Teppanyaki grill and an adjustable sun awning to cope with the rigours of the midday sun.